Changing your clothes is an easy way to change how you look, but sometimes that is not enough. Sometimes you need to change the appearance of your face, to change your disposition or age. While changing the appearance of your face is not standard in everyday life, it is common practice in the theatre and on film. 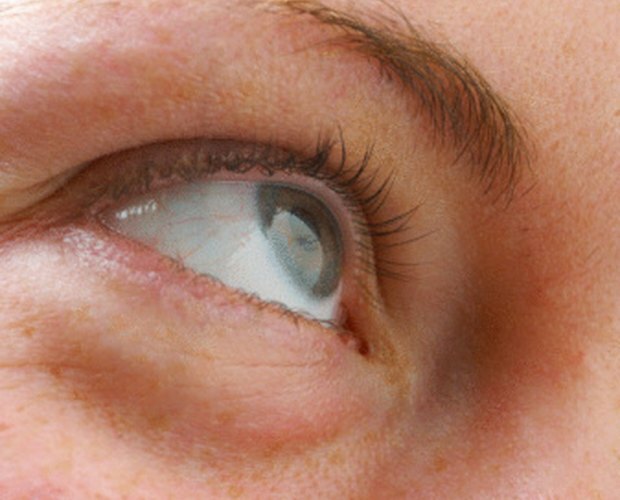 Eye bags can be created to make you look tired, or as a part of old age makeup. 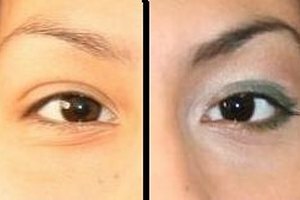 Using cream stage makeup, you can create bags under your eyes that will fool the audience. With enough practice and a steady hand, you may even be able to fool the person standing next to you. Apply a thin base layer of base foundation using a sponge. This foundation should be one shade darker than your natural skin tone. Do not cake the makeup on. Blend the edges of the foundation out, to prevent a line from showing-up where the makeup stops and the natural skin starts. This foundation creates a layer that allows the next layer of makeup to move and blend. Locate the bone that creates the lower eye socket. Use your ring finger to familiarize yourself with that bone, as it will be the line you follow to create the eye bag. Create a structural shadow in the inner corner of your eye; dabbing a touch of character shadow with your flat brush. Blend out and down, leaving the corner of your eye the darkest. Dip a flat 1/4-inch makeup brush into character shadow. Dab the tip of the brush on the back of your hand to eliminate excess. Start at the inner corner of the eye drawing a hard line following the top edge of the eye socket. Strive for a uniform width line that tapers off at the two-thirds point. Wipe the excess shadow from your brush onto a paper towel. Place the brush tip parallel to your hairline on the shadow line. Start in the center of the shadow line and blend the color upwards, making the widest part of the soft edge shadow in the center of the eye. Do not allow the blending to be more than 1/4-inch wide: It should not touch the lash-line. Keep a hard edge along the cheek bone. Get a clean flat brush and dip it in the highlight. Place the brush under the character shadow, as close to the hard edge as possible -- without smearing the blended shadow. Wipe the excess off the brush. Start in the center of the highlight and blend the color down onto the cheekbone, balancing in equal proportion the shadow. Dab a tiny amount of highlight to the fleshy part under the eye, but above the shadow and blend. This will give the illusion of puffiness. Press, do not rub, translucent powder over the makeup to set the makeup eye bag. Powder will tone down the makeup by almost half, so apply the makeup darker than normal, to allow it to read, after the powder.